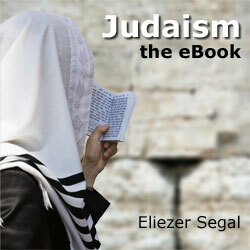 Judaism—the eBook is a self-contained textbook for a one-semester introductory course on Judaism. Designed for undergraduate level study, it provides everything students and teachers could expect from a printed text and more. The main aim of the book is to provide an accurate survey of the religious character of Judaism, describing the most important practices, literature, institutions, values and beliefs. It will attempt as much as is possible to present religious topics as they emerge from authentic Jewish documents, rather than imposing foreign theological or methodological structures. Accordingly, the description of the Jewish religion will be derived more from sources like the liturgy than from esoteric or scholarly works of philosophy or exegesis. The observance of commandments and religious law will be treated in depth, in keeping with their centrality in the life, thought and values within actual Jewish communities. Unlike other surveys of Judaism, which do not draw distinctions between the religion and Judaism and the history of the Jewish people or the attitudes of others to Jews and Judaism, this book will focus specifically on Jewish religious phenomena, such as observances, institutions, beliefs and values. It will strive to take into account the immense diversity and creativity of Jewish expression over the religion's long and varied history, approaching it from historical, geographical, gender and social perspectives.